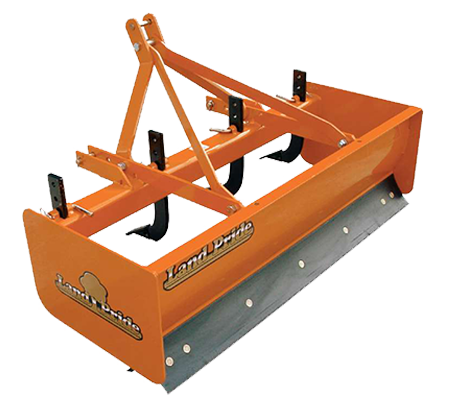 The Land Pride BB05 Series Fixed Bar Box Scrapers are designed for Category 0, 1, and 1 limited 3-point hitch for mounting to subcompact tractors. The Land Pride BB12 Series Box Scrapers are designed for Category 1, 3-point hitch or Quick-Hitch System mounting to tractors up to 30 HP range. Both Box Scraper models are ideal for ripping, levelling, finish grading, and backfilling applications at small feedlots, outdoor arenas, building sites, and maintenance operations for small landowners. The manually adjustable ripping shanks and the fore and aft cutting blades make these units especially effective and productive for small projects.